Hubby and I took advantage of the unseasonably sunny January day to walk around downtown Portland around the Westin hotel where we were staying. Although it was sunny, it was quite frigid with the temp hovering around 31°F. It was that kind of nippy chill that numbs one's lips. The dewpoint was so low at about 14°F that condensation didn't ever form on our drinking glasses of ice water when we ate lunch at the Daily Grill restaurant. That's really low humidity for anywhere, but particularly for the Pacific Northwest! But because of the lovely sun, we made a concerted effort to walk on the sunny side of every street, literally. In the shadow of buildings (as in the photo at left) the chill would go right through us namby-pamby Bay Area Californians. But on the sunny side of the street it was quite lovely. We enjoyed the architecture of Portland immensely. There are many historic buildings, lamp posts, sidewalk grates, and other historic elements of urban living that I was able to take photos of for my resource file for graphic design inspiration. We found the people of Portland to be very friendly (as we find to be the case throughout the Pacific Northwest). We enjoyed walking past the Culinary Institute with delicious aromas emanating from within and then chatting with a student chef about what they made that day (bread). We also chatted with the women in the optical store that had a great selection of fun and funky glasses frames. Just outside that store we found this lovely pink bicycle with live begonias in the basket (photo at right). Doesn't the photo look like it was taken in the spring or early summer? Ha! Don't be fooled. It was below freezing in the shade! Throughout the downtown area where we strolled, we came across large sidewalk planters with various plantings in them. 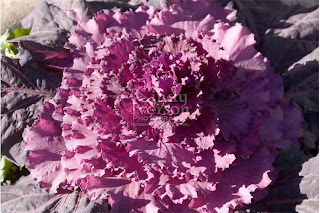 The purple ornamental kale was quite happy despite the cold and simply gleamed in all its brilliance in the January sun. Some pansies in other planters we came upon were just as miserable as the kale was happy. Droopy, pathetic, and downright frost-bitten the normally cold-hearty pansies just couldn't take it. We were told repeatedly by locals that it was unusually cold as well as unusually sunny. I think if the pansies could have talked, they would have agreed. What we found the most amusing about our trip was that we hadn't seen the sun for a week back home in the San Francisco Bay Area and that we had to fly to Portland in order to find the sun! I was soaking it up through the entire two days. I'm gonna get my sun (and the Vitamin D) wherever I can! 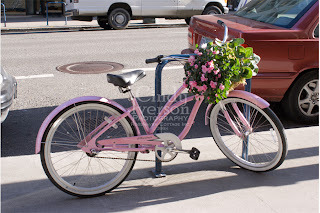 I so wish I could have a pretty pink bicycle like that! 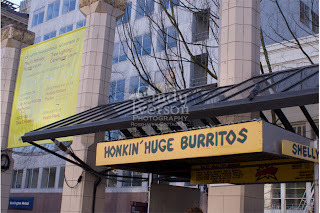 I could use a honkin' huge burrito right now! Ohhhh, that pink bike would look great in a painting! There is always a little 3 week window of no rain in January/February in Portland. That's when everyone gets out and cuts back their rose bushes. LOVE Love Love that bike!!! Too cute!